Ellie's dam is D & S Harley Girl and her sire is White Oak's Ready to Rumble MH. She weighs about 70lbs and is one sweet girl. Easy going and easily trained. Her nickname is "Princess"! Ellie earned her Junior Hunt Title on June 12, 2010, her Senior Hunt Title on 9-16-12, and most recently her Master Hunt Title in July 2014!! Ellie is retired from testing and has become full-time hunting partner. GMHR MHR WR TTF CAS-HI Shady Character – Oakley...Affectionately known as ‘Oak’, he has proven to be one of those dogs that you know you’ll always remember in life. Mr. Calm and Cool in the house, around other dogs and children, he flips his switch when its time to go to work. He loves a good ear scratch and often will just lay his head on you waiting for it. However, it’s all business when it comes to retrieving, whether its just training with bumpers, running a hunt test or actually out hunting, Oak will stop at nothing to get his bird. The fox red coat, muscle definition and his abilities as a finished retriever have made him invaluable at Castle Heights kennels. Always the ‘go to’ dog when it comes to hunting, he excels at waterfowl as well as upland game. He earned his MHR title in 2015, allowing him to run the 2015 NAHRA Invitational, where he also qualified. In 2016, Oak went 8/9 in tests earning his GMHR as well. 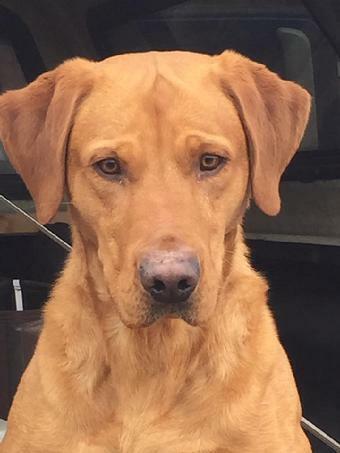 Oakley is owned by Dave Combs, Castle Heights Gundogs, in Geneva, New York. Dew Claws were removed on February 6th. Pups will be wormed at 3, 5, & 7 weeks of age, and pups will receive their 6 week vaccines and be vet checked and certified healthy by Dr. Sam Yoder of Silver Maple Veterinary Clinic. Born and raised in our home....well socialized. Ready for new homes March 24, 2017.